Taking care of small pets can be challenging, especially if you are new to keeping small rodents as pets. 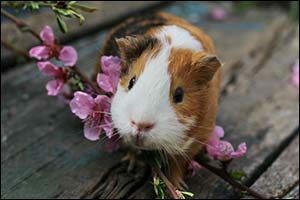 Hamsters, Guinea pigs, rabbits, gerbils, rats and mice are commonly known in the veterinary industry as “pocket pets” because of their small size. However, New Bedford pet owners still need to be aware of the proper care and feeding that is required in order to help these small pets live a long and healthy life. A regular veterinary check-up should also be performed, as well as ongoing home care, for best results. Veterinary care in Massachusetts for pocket pets can be found at Anchor Animal Hospital in Dartmouth. We specialize in cats, dogs and small pets for New Bedford pet owners and pet owners throughout the South Coast region. Start your pet ownership with a trip to our veterinary hospital for an initial check-up. Veterinary check-ups are used to build a baseline for your pet, to see him or her when they are healthy, in order to provide them with even better care if they need it in the future. These small rodents as pets are different from other types of pets, particularly due to their size. If you want to take good care of your small pet, you need to take time to learn what they need in the way of habitat, nutrition and veterinary care in Massachusetts. Habitat includes the type of enclosure that they need, along with substrate, bedding, temperature and sometimes even humidity. Small pets require a lot of care and attention – they should not be taken on lightly. In fact, some pocket pets can even require more from their owners than cats and dogs. Nutrition is very important. Many pet stores get it wrong when it comes to the dietary needs of keeping small rodents as pets. The basic dry food that is sold in most retail shops is lacking the basic nutritional needs that your pet will require. Human food for small pets should be avoided at all costs, as it can have more fat, protein and sodium than many pocket pets can handle safely. They might “like it” or give you indications that they “want it,” but you should stick to a diet that is prescribed by your veterinarian. A combination of seeds, fruits, vegetables and other foods that are designed specifically for the type of pet that you have should be offered on a daily basis, along with clean, fresh water. When it comes to veterinary care, make sure to bring your pocket pet in for a visit twice each year. Small animals can seem a little off one day and be devastatingly sick the next. Because they are so small and their metabolism is so quick, a tiny illness can become a serious problem in no time at all. Bringing your pet in for a veterinary check-up every six months can help you stay on top of any health problems. Preventive veterinary care should be important to all New Bedford pet owners. Even small pets require regular exercise and activity. It is important for your pet’s health and long-term well-being. By playing with your small rodents as pets regularly, you can keep them used to engaging with people, which will make it easier for your future veterinary care in Massachusetts, should they become sick. Play with your pet, provide appropriate toys and exercise equipment, such as a ball or wheel for hamsters, mice and gerbils. Small animals also require attention because they are very social. The more time you can spend with them, the better. Also, when you play with your pet daily, you will be more likely to notice any health issues that might pop up. New Bedford pet owners are encouraged to contact our veterinary office if they notice any signs of sickness, lethargy, bumps, rashes or other symptoms that are common to your specific type of pet. Your veterinarian can also assess your small rodents as pets for any risks that you might want to be on the lookout for in the future. Preventive veterinary care in Massachusetts can be provided to keep your pet healthy. New Bedford pet owners should contact Anchor Animal Hospital by calling 508-996-3731 to schedule an appointment for a veterinary check-up for your small rodents as pets, or to learn more about the type of care that we provide. We offer services to pets and their owners throughout Southeastern Massachusetts and Rhode Island.